There are several large protests going on around the country to speak out against what people feel was an unfair loss in the presidential race due to the way the Electoral College supersedes the popular vote. 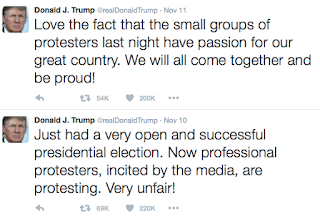 Regardless of what you think of the protests (personally, I think it's great for people to speak out but the election process is what it is for a reason), it's The People's right to protest. Freedom of speech, after all. 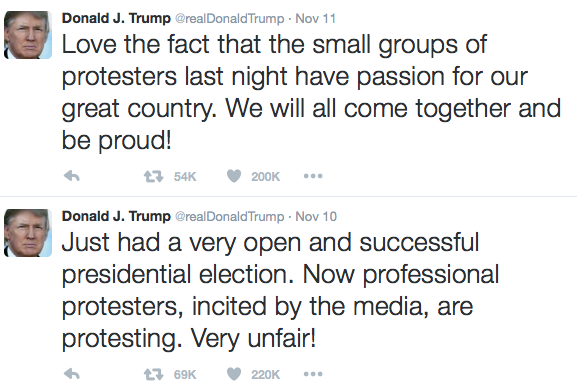 But Trump couldn't last more than 48 hours without tweeting about how unfair it is to him and about how it's the media's fault. Then, of course, his advisors apparently told him to tone it down, so he walked it back. I'm going to stick this in the "bad" column, because even though he changed his comment, it shows that he couldn't control himself.